Cranaleith celebrated its 20th Anniversary at a gala September 27, 2018, at Knowlton Mansion in Northeast Philadelphia. More than 200 business and nonprofit leaders and philanthropists attended the event. “Tonight gives us the opportunity to celebrate Cranaleith’s first 20 years, the 80 seasons that Cranaleith has been a place of transformation and healing for thousands including those living in poverty, people struggling with addiction and those with mental health issues, said Charlene Flaherty, Cranaleith Executive Director. 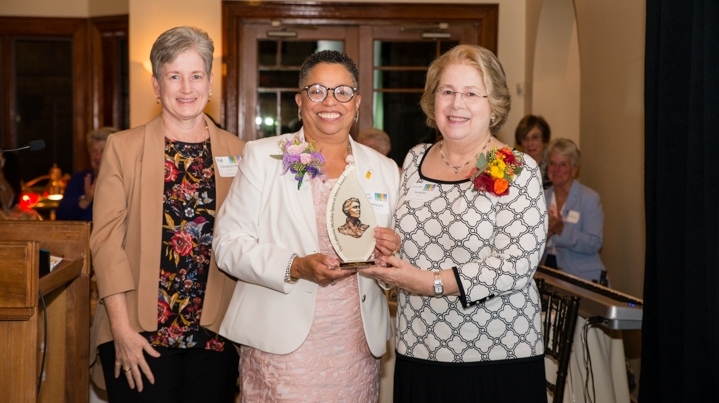 Sharmain Matlock-Turner, President and CEO, Urban Affairs Coalition and Maureen H. McCullough, JD, Northeast/Mid-Atlantic Regional Director of Catholic Relief Services received the Catherine McAuley Award. Rose Martin, RSM, Hope Partnership for Education received the Cranaleith Founders Award.